The quick links above to navigate to more detailed info below! The JM-HPT-A is a hydraulic Pallet Jack with 2.5 Tons capacity. The pump body is fabricated by assembling the separated parts using threaded connections. All the joints are fitted with seals to ensure oil does not leak. 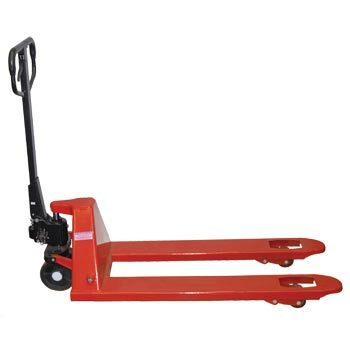 12 pump strokes to max lift, lift height per stroke - ½"
The JM-HPT-A Pallet Jack's weight is just under 195 LBS. If you have any questions or would like more information on this equipment, PLEASE CALL US AT 1-888-736-5094! Due to size & weight, this item will be shipped by common carrier. For more information, it is always best if you call us at 1-888-736-5094 to get a shipping quote and to review Complete Hydraulic's procedures with one of our sales associates. It is vital for the customer to understand what is required of them for receiving these shipments! If you have ANY questions, please call us at 1-888-736-5094 and one of our friendly sales associates will be happy to help you! For residential deliveries, the customer's address must be able to accommodate a large 18 wheel truck pulling into and out of the drive. THE CUSTOMER IS RESPONSIBLE FOR UNLOADING THE PRODUCT FROM THE TRUCK! * Liftgates are available. Residential charges may apply. PLEASE NOTE: Truck companies may place a reasonable time limit on how long customers are allowed to take before charging extra fees - please ensure you are prepared & ready to unload your equipment when the truck arrives. Due to the size of this equipment, customers MUST have a Forklift, wrecker boom or similar piece of equipment to unload their product from the truck. If you are unsure about unloading this equipment from the truck, do not have the space available for a semi tractor w/ a 53 ft trailer, or do not have the necessary equipment for unloading the product(s) from the truck, we STRONGLY recommend having the equipment delivered to a business address* with a dock that is equipped to unload large trucks. *For customers unable to accommodate a large truck at their residential address and have no business address available, we strongly urge them to have the garage equipment shipped to a local trucking terminal. The terminal staff will be able to unload the equipment from the truck and onto a truck or flatbed trailer for you. *If the customer is tax exempt - A TAX EXEMPT FORM MUST BE PROVIDED to avoid taxes on their on-site purchase! For a more thorough overview of CHSSI's shipment policies, click here.